Remember the days of going into a bakery and walking by tall displays of mock wedding cakes or being bombarded with the smell of fresh baked cookies from the moment you walked in the door? From the mind-altering smell of a just-iced birthday cake to the sight of sugar glaze being poured over cookies and pastries, the classic, unspoiled storefronts of these bygone bakeries have served many sweet memories to us all. William Grant, sole proprietor of Grant's Pastry Shop, started his baking career at the age of 9, at Wilder's Bakery and then went into business for himself in September 1969. Grant's Pastry was known to have some of the most amazing petit fours, brownies, and tea rolls in Middle Georgia. After Mr. Grant's death, his family closed the Poplar Street business. William S. "Bill" Waldorf and Dixie L. Waldorf started Waldorf's pastry shop in 1949 on Vineville Avenue. For years, the Waldorf's served the people of Ingleside and surrounding areas some of the best cakes, cookies, pastries and baked goods. Waldorf's later sold the business to an Argentine couple named Mr. and Mrs. Abel Melchiore who continued to operate the bakery just as Waldorf's did. However, because the name 'Waldorf's Bakery' had been sold along with the business, Mr. Waldorf had to use a new name when he opened his new bakery; Bill's Bakery in Shurlington Plaza. Hefner's Bakery was located in Westgate Shopping Center, also known as Westgate Mall, the first enclosed mall in Georgia. After a day of shopping, shoppers could dine at G&M Cafeteria and then get desert at Hefner's Bakery. James Lary's love of baking began when he worked for Mr. Isak Nygarard of Nygaard's Pastry shop during his teens before opening up Lary's Bakery in Macon Ga. Memories of his signature cheese straws, apple fritters, custom cakes, petit fours, pies and cookies evoke pure food nostalgia for Maconites who fondly remember Lary's Bakery. Formerly located on Forsyth Street, the Forsyth Street Bakery offered "home-baked flavor by using tested recipes and choice ingredients." 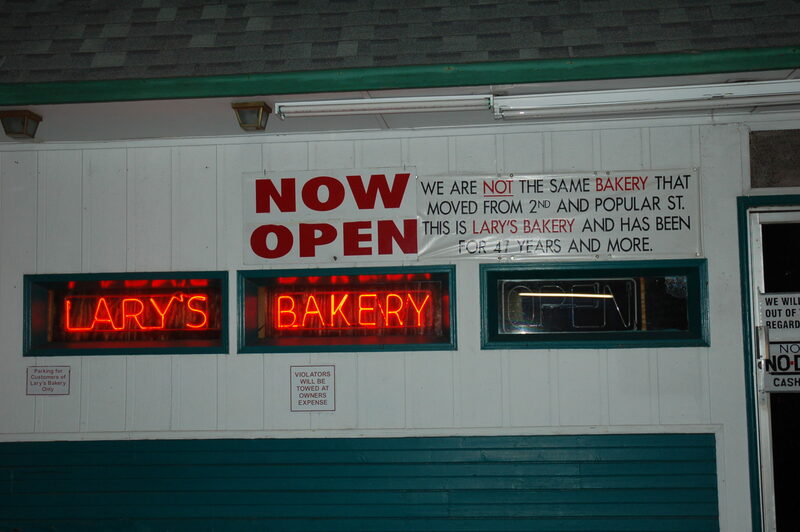 The bakery was run by a "Butcher, baker and Aviator-Maker" named Robert "Bob" Day, Sr. and his wife Virginia (Ginny) whose donuts, lady locks, raisin hermits, apple cake and fresh pound cake are still remembered to this day. Feeling a little nostalgic? Check out these 5 places that are missing from Macon.